The Razer Turret (available for $150 on Amazon) is the first mouse and keyboard I don’t mind leaving around my living room. Is it 100-percent functional? No. Is it 100-percent practical? Also no. But its compressed size and inconspicuous design make it easy to hide in your entertainment center for convenient access. To me, that’s compelling, even given its limited usability. The problem of the mouse and keyboard has plagued living-room PCs for a long time. I don’t rightly know why—in theory, it shouldn’t be any different from leaving an Xbox controller on the coffee table. And yet, even I, hardened PC gamer that I am, find it a bit too conspicuous to leave a mouse and keyboard on the coffee table at all times. Maybe it’s a marketing problem or something. Microsoft should funnel some research money into it. Nevertheless, PCs are entering the living room in ever-increasing numbers, and so it falls to peripheral manufacturers to solve the issue. Some, like Corsair’s Lapdog, confront it head-on by bringing the desk right into the living room and ignoring the desire to discreetly stow away a mouse and keyboard. Razer falls on the other end of the spectrum with the Turret—a keyboard and mouse that work around the needs of the living room. The Turret is wireless, for one thing. While the Lapdog requires a 10-foot wire tether, the Turret connects to your PC via Bluetooth or a 2.4GHz-wireless USB dongle. Not only does that make more sense for high-traffic areas, but it’s quite a bit more convenient—just stash the lapboard next to your couch when you’re done, or leave it on the coffee table overnight. No worries about tripping over it and yanking your PC off a shelf. The Turret is also rechargeable. And foldable. The Turret is technically two pieces: the mouse and keyboard. When not in use, the keyboard folds in half (the mousepad part goes to the back), and then you set the whole thing inside Razer’s custom vertical dock. The mouse has a separate slot in front. The Turret in storage is actually pretty damn attractive, so at home I’ve stashed the dock on my entertainment center, right in front of the PC it controls. But you could just as easily set it next to the couch or hide it behind your subwoofer—anywhere it can reach an outlet. Razer’s typical black-and-green color scheme is the Achilles’ heel of the Turret, in my opinion—the most likely reason someone would hide it away. It’s an aggressive look, a very “gamer” aesthetic, and not necessarily what everyone wants in a living room. Still, the accessories are remarkably inconspicuous, considering they’re a working mouse and keyboard. Let’s put “working” in quotes, though. The Turret’s design incorporates quite a few compromises in order to fit the needs of the living room, and the result—while attractive—falls a bit short on performance. I’m not going to complain about the Turret’s laptop-style scissor switches, since that’s what makes the board so slim. I will, however, complain about the fact that the keys aren’t backlit. Most of my time with the Turret was spent in the dark—a standard living-room gaming environment, I think. The Turret’s the first keyboard I’ve used sans-backlighting in a long time, and it’s as frustrating as ever. And doubly baffling because Razer’s so gung-ho about lighting on its other products. Razer boasts that the Turret’s battery lasts 40 hours on a single charge. Surely we could make do with a shorter runtime in exchange for backlighting. I admit, it’s hard to even verify Razer’s battery claims, because 40 hours is a stupendous amount of time to keep the Turret running without returning it to its charging dock. All I can say is I never had it run out of battery while I was using it. Nor did I ever come close to running out of battery. Then there’s the mouse. The Razer Turret mouse is an offshoot of the diminutive Razer Orochi, a small ambidextrous mouse. Really small. Too small for my hands, although I’ve managed to figure out how to use it with a modified claw grip for low-intensity games like Civilization or The Warlock of Firetop Mountain or Broken Sword (strategy game, interactive fiction, and point-and-click, respectively). The Turret lacks both the space and the precision for faster-paced gaming though. With a mousepad that’s maybe six inches wide, you’ll need to run at a fairly high sensitivity to even navigate your desktop (especially if you have a 4K TV). Shooters feel borderline unplayable. The fact that the Turret’s mouse is lightly magnetized to the surface doesn’t help. It’s a smart design choice for day-to-day use—you can tilt the Turret maybe 30 degrees in any direction before the mouse moves involuntarily, a detail I didn’t appreciate until I used the Corsair Lapdog and my mouse slid all over the place. But for gaming, the magnets are a hindrance. Even after hours and hours spent with the Turret, I’m still not used to the way the mouse feels, whether because there’s a lot of inertial resistance up front or because the mouse fights you during every movement or because it slows down quickly at the end rather than gliding into place smoothly. 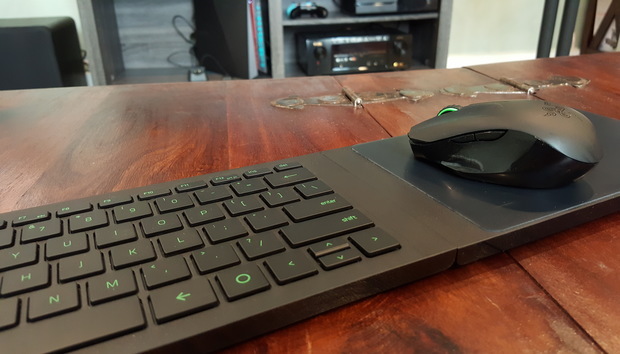 And so we come to the crux of it: The Razer Turret is a great mouse and keyboard for the living room, a beautiful device that sits comfortably in your media center and doesn’t call undue attention to itself. But it only works if you’re looking for something to run Netflix, browse the Internet, and maybe play a few slow-paced games. Whether that’s worth the Turret’s list price of $160 is hard to say. There are other, cheaper devices that can handle non-gaming use just fine (Logitech’s K400 Plus, for instance, is $40 and also easy to hide away). The Turret’s dock, build quality, and use of an actual mouse do make a somewhat compelling argument in its favor, however. If your living-room PC is a console replacement, though, and you’re looking for a gaming-oriented mouse and keyboard? Best look elsewhere. The Turret will just slow you down.